The open road is every motorcycle rider's true calling, but you can't embark on that journey without the proper set of on-bike luggage. Saddlebags help you travel farther and see more, and pairing your bike with that perfect set is just as important as the adventure itself. 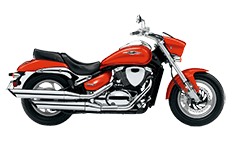 For Suzuki M50 Marauder owners, we have this awesome selection of saddlebags designed specifically for use with this model, mounting with the greatest of ease and staying close to your person when the road gets bumpy. Check out each of the bags in our catalog to learn more, or hit us up to see what kind of deals best serve your needs.